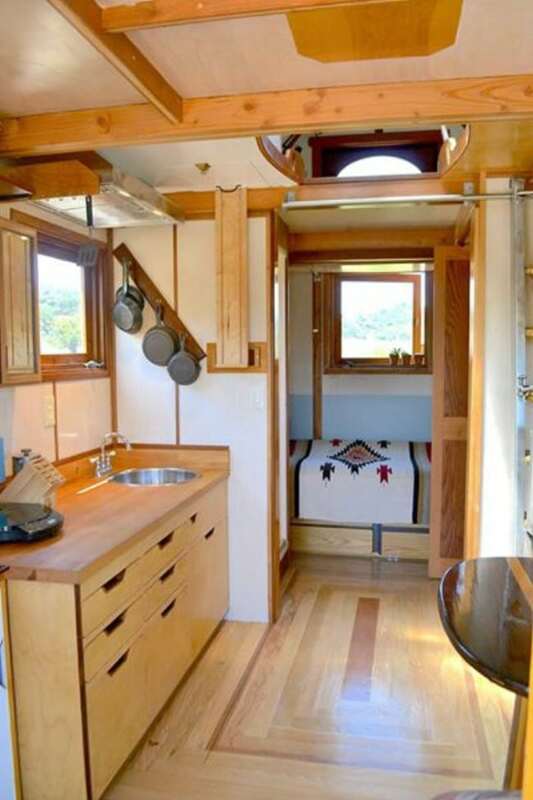 One tiny house which recently caught my eye with its stunning interior is this one for sale in Santa Cruz. 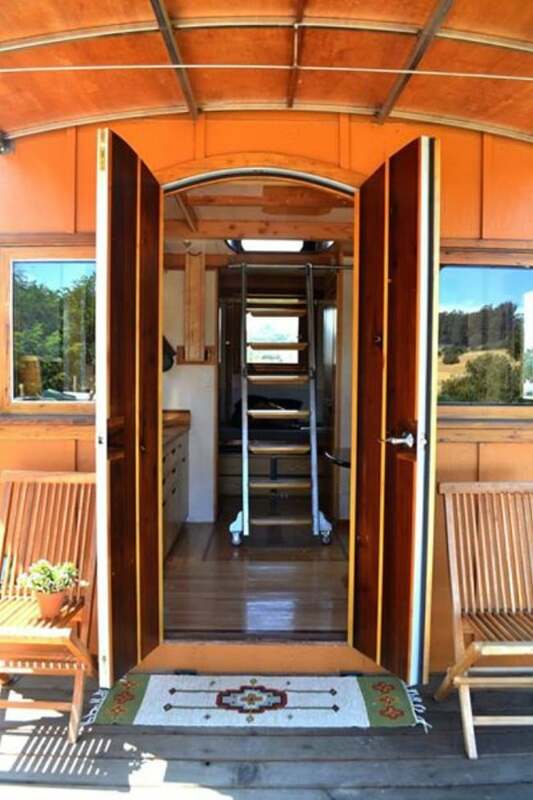 The home was constructed out of upcycled and recycled materials, and is off-the-grid ready. This is unfortunately the only photo of the house’s exterior. It gives us a great look at the porch, but sadly it only hints at what the outside of the house might look like. This photo of the kitchen reveals why I couldn’t help but share the listing anyway. The half-timber look of the walls is really unique, lending the house an almost Tudor vibe. At the same time, the light, warm wood colors provide a distinctly different flavor to the architecture. Alternating hues of wood give the floor a decorative effect as well, nicely complementing the half-timbers and the kitchen cabinets and countertop. The furnishings of the house also echo that half-timber look. The house offers lots of storage space for your belongings. The sink is a little small, but this is a minor detractor. 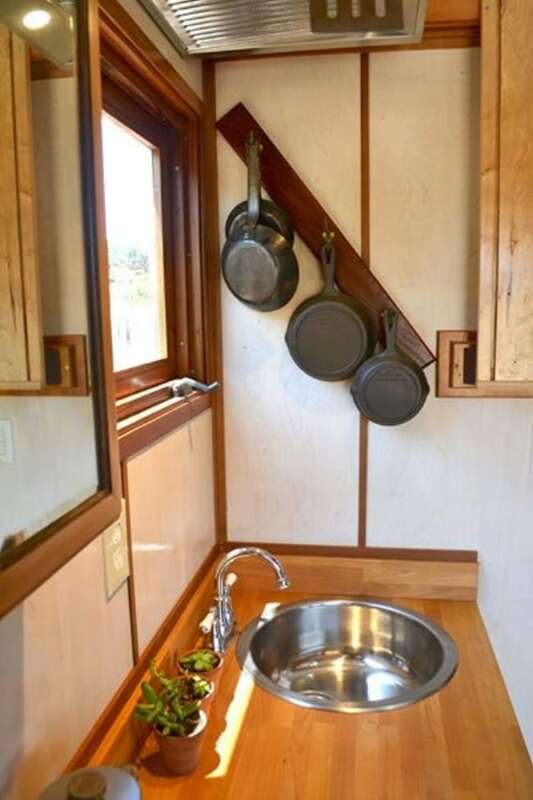 Note how the clever angling of the hooks for the pots and pans allows for more storage than a horizontal plank would have provided. 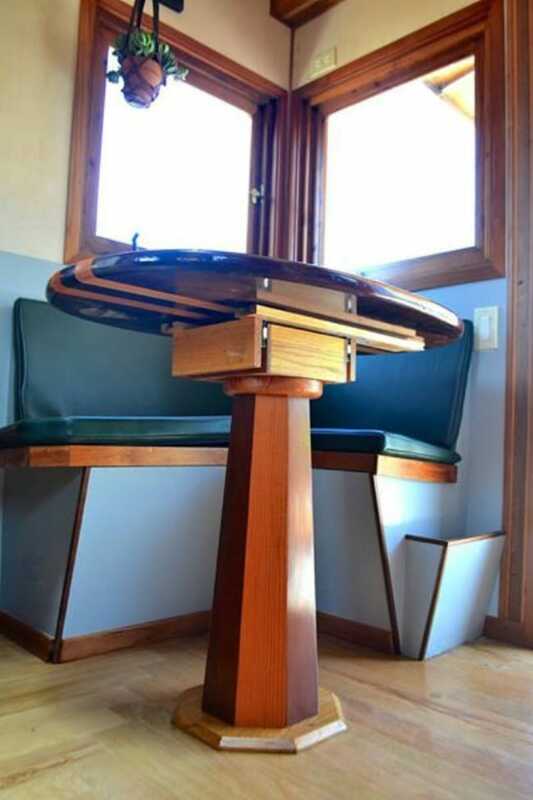 It also adds to the home’s unique look. 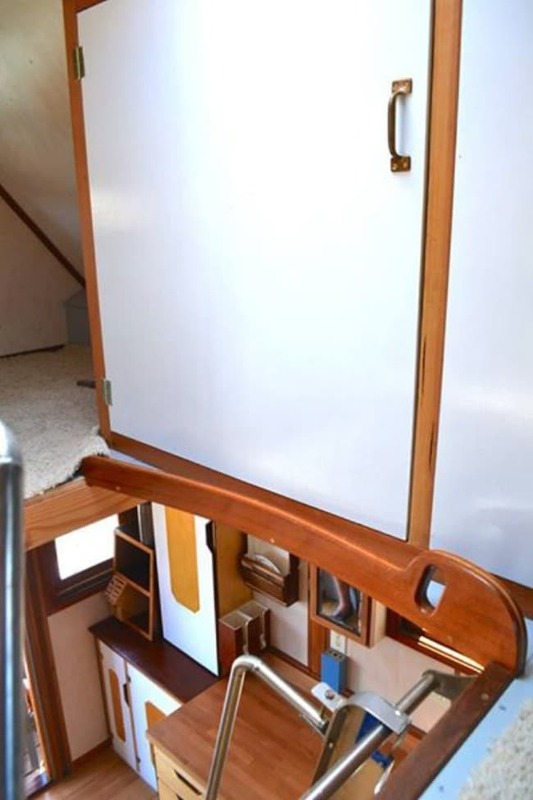 This storage space up in the loft is amazing! You could fit so much in there. 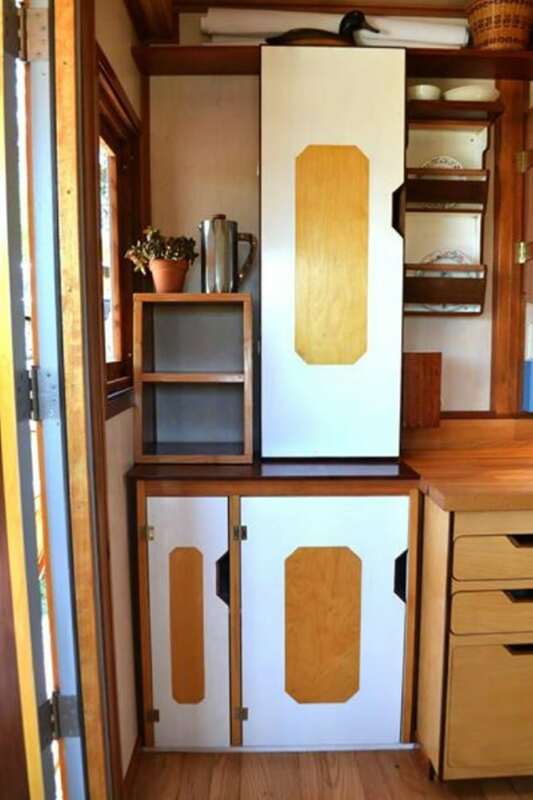 Seriously, those cabinets are huge! 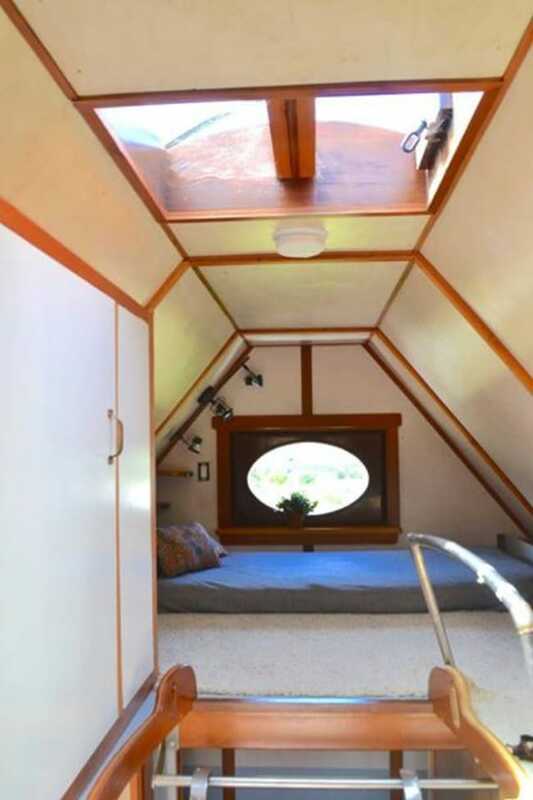 The loft features a cool little oval window and some extra headroom over the middle of the bed. There is also a skylight which shines down into the main living space. I like how this loft is a bit more private than most. In terms of amenities, this home comes with everything you could ask for in the kitchen, including a fridge, cooktop, microwave, and sink. There is a washing machine, a toilet, and a shower. With solar hook-ups already ready to go, you can park this house off the grid and live comfortably. 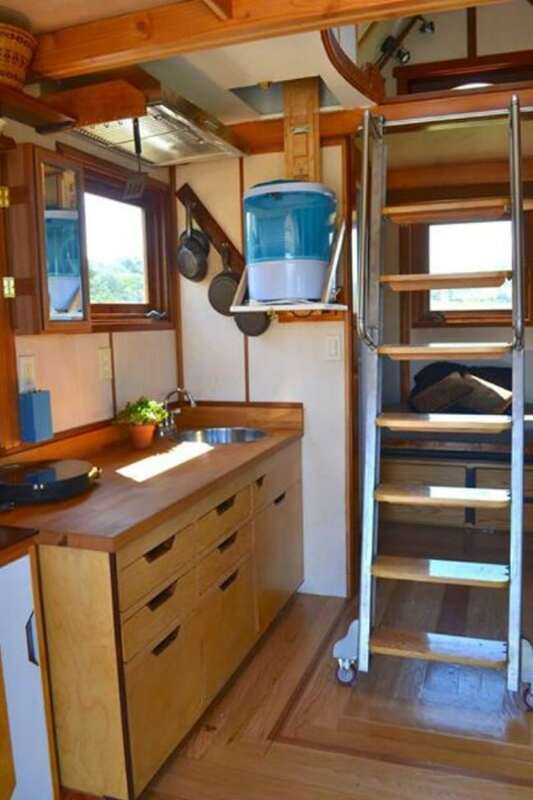 You can learn more about this lovely tiny house for sale by visiting its listing on Tiny House Marketplace. As of the time of this writing, the price is $59,999. That seems like a pretty sweet deal for such a unique home.